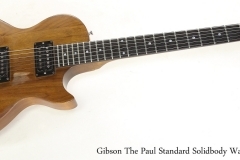 Here we’re looking at a Gibson The Paul Standard, the Walnut body version, dating to March 8 1979 at Gibson’s Nashville, Tennessee plant. (For those who keep track of such things, that makes it a Pisces from the Year of the Goat). 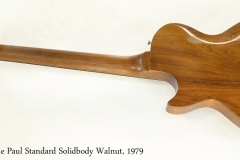 The construction is Walnut for the body, three-piece Mahogany for the neck, with an Ebony fingerboard and Mother of Pearl dot position markers. Tuners are Grover Roto-Matics with ‘Tulip’ type metal buttons, paired with a tune-o-matic bridge and stop tailpiece. Electronics are straight Gibson – a pair of exposed humbuckers, pickup selector, individual volume and tone controls, and an output jack on the edge. This guitar is in complete and original condition, and has been used as intended. Consequently, it is nicely worn in, and sounds an feels great. It’s very warm and responsive. The fact that it has been ‘used as intended’ does mean that the frets are fairly low, and if one were going to gig with this guitar, a refret would be in the cards. Still, with some minor setup adjustments, it is quite playable as is. The nitrocellulose lacquer finish on these guitars was intentionally thin, and there is a fair amount of honest play wear. The contours make it very comfortable, and the walnut provides a smooth warmth that’s different from Mahogany. The neck uses a three-piece Mahogany construction, with a volute behind the truss rod adjuster cavity and a shallower head pitch – these guitars are not as prone to damage as the 17-degree tilt headstocks. I like this guitar a lot. It’s relatively light, but solid, and feels like a straight ahead rock guitar – in the vein of the early Les Paul Junior models, but with humbuckers. A Gibson hard shell case, likely the original, is included.